The words “teenager” and “lazy” seem to go hand-in-hand when people voice their opinions on the work ethic of young adults, but why is that? In short, the majority of teens are chronically sleep-deprived. Staying up too late and then having difficulty waking up for school and falling asleep in class are common experiences for teens. And when they struggle as a result of these things, they are called “lazy” and asked why they can’t just go to sleep earlier. As it turns out, sleep phase delay, an inevitable physical change in the teenage body clock, is the culprit. Teenagers tend to stay up late because their body quite literally forces them to, not because of laziness or unorganization. Humans naturally have a 24-hour cycle of feeling energetic and feeling sleepy, called the circadian rhythm. The body usually feels more energized during the day and starts to fatigue at night. During puberty, teens go through what is called sleep phase delay, which essentially shifts the body’s natural circadian rhythm forward by about two hours, which means the need for sleep is delayed by the same amount of time. In younger adolescents, sleepiness usually sets in between 8 and 9 pm. As puberty hits, teens begin to feel tired between 10 and 11 pm, which shifts the times they feel alert later in the day as well. This effect fades as one approaches adulthood, combined with the fact that adults need less sleep than teenagers. Let’s take a student at Conant, for example. Conant starts at 8:15 a.m. for most students. Taking into account the time needed to get ready and to commute, let’s say that this student wakes up at 6:30 am. A teenager needs around 8 hours of sleep, so the student should be asleep by 10:30 p.m. at the latest. However, the teen body perceives these times differently. 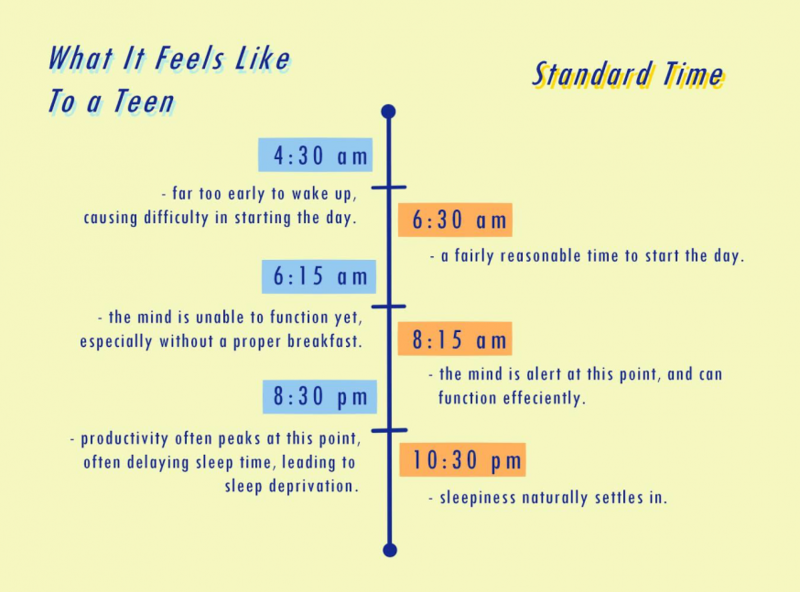 Because teens’ circadian rhythms are pushed forward two hours, waking up at 6:30 a.m. feels like 4:30 a.m., and going to sleep at 10:30 p.m. feels like 8:30 p.m. These timings seem a little unreasonable. The mind would still be alert at 8:30 p.m., and a 4:30 a.m. wake-up every day would be exhausting for most people. And that’s exactly why so many teens are indeed exhausted. The average school schedule is unfit for the majority of teens and hinders them from being fully alert when they need to be, leaving their full potential of learning unreached. Both the American Academy of Pediatrics and the Center for Disease Control and Prevention recommend a school starting time no earlier than 8:30 a.m. Conant is not too far off with its 8:15 a.m. starting time, although even a 15 minute delay may be beneficial to students. 15 minutes can give students time to grab breakfast, talk to teachers, or just having extra time to relax. However, several other schools in District 211 start at 7:30 a.m., an entire hour earlier than recommended. However, changing start times do pose some obstacles. D211 shares buses, requiring staggered starting times. If all schools were to start after the recommended 8:30 a.m. starting time, schools needing later buses would start at 9:15 a.m. Later start times mean later end times, and extracurriculars that occur after school would be pushed back along with it. The set up of extracurriculars would have to fundamentally change, which could include using free periods for club activities and making use of weekends. Changing start times would require a rethinking of the entire school system including scheduling and transportation, and a large budget to implement these changes. These changes cannot be done easily, and will require an agreement that the benefits will outweigh the challenges this change will bring. The benefits are significant and are worth considering, however. Several districts in the U.S have pushed back starting times and have achieved positive results, such as fewer tardies and more students using breakfast programs and tutoring. A more suitable starting time can help increase the awareness in morning classes, cut down on rushed mornings where students find themselves skipping breakfasts, and lead to a general increase in the overall mental wellness of teens. A healthy mental state is crucial, especially in the teenage years, and a constantly exhausted mind during development can create long-lasting impacts. Later starting times not only make the mornings before school less daunting; they help students achieve a better lifestyle and better mental health. Perhaps the common notion that teenagers are “just lazy” needs a much bigger fix than the teenagers themselves–maybe the system needs repair. Setting back the starting time for high schools can help teenagers value their health alongside their homework, achieve proper sleep, and make education about learning instead of trying to stay awake.